Easter….another holiday that seems to revolve around candy. Ugh! Fortunately, a friend taught me a trick. 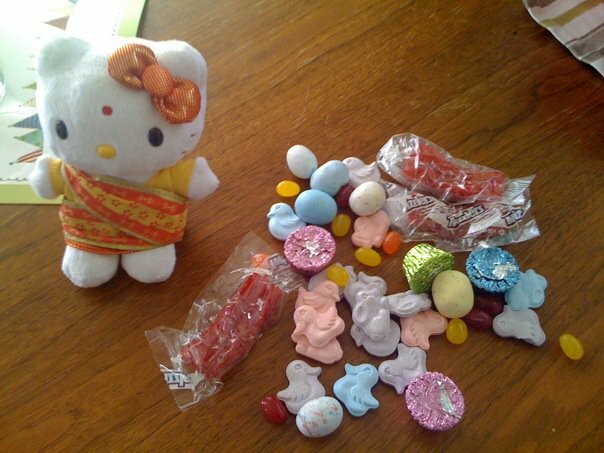 You offer your kid to trade all but one candy of their choice for a toy of their choice. P traded all her stuff for an India Hello Kitty, which she had been wanting for a while, and I remembered to have on hand for the occasion. I fill our eggs with anything but candy. I make sure it’s fun stuff they’ll like to play with. I love everyone else’s kids just as much. I can’t bring myself to sugar them up either. I know this isn’t all in my head. Today, after all of yesterday’s sugar, P was wired. Part of her bad behavior was due to teething but today she was tuned up a few extra notches. However, I think we made up for the overload at dinner tonight. I served P potato au gratin with 6 carrot rounds and 3 “dragon boats”, aka red bell peppers. She didn’t like the potatoes so she ate all the veggies! I gave her a choice, a fork of potato or a veggie. She chose veggie every time. I even came up with a saying “a dragon boat in the mouth is worth two in the hand”! Who knew if I make an adult meal I know we’ll like, she’ll eat healthier! Which brings me to another point: no more gelato.